THIS week an interesting photograph was shown to me and the wonders of modern technology allowed me to scan it into my computer in seconds. The photograph is an interesting shot of the canal boat, 29B, as it approached the horse bridge on a summer Sunday afternoon in the mid 1950s. The exact date is not known but the occasion is one I remember well. It was during the carnival held in the Dominican field organised, I think, by the Parish Church Development Fund Committee. 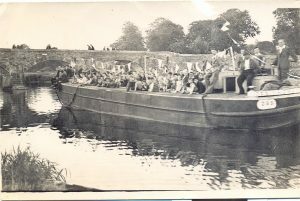 The canal boat was made available by its owner Denis Rowan of Pairc Bhride and happy trippers crowded onto the boat for the short journey downstream. I can recognise Mick Rowan at the helm with his brother Denis sitting facing the camera and standing behind him is Joe O’Neill playing his piano accordion. I can remember as a young lad the excitement I felt on travelling on the canal boat during that carnival. A tune popular at that time always associated in my mind with that trip, **********How much is that doggy in the window***********was the song sung with gusto by the canal boat passengers to Joe O’Neill’s accompaniment. Health and safety inspectors were not thought of in those days as evidenced by the many happy trippers sitting at the front of the boat with their legs dangling over the side of the boat. The 1950s was a time when little or no use was made of the River Barrow or the Grand Canal in terms of boating. Swimming and fishing were certainly very popular pastimes in those days but an outing on a boat was a unique event. The carnival boat trips were extremely popular and indeed were regarded by many locals as the highlight of the carnival. As I walked over the Crom-a-Boo bridge this afternoon I was delighted to see five pleasure boats moored at the old harbour, while two canoes passed under the bridge. What a contrast to the scene one would have witnessed standing on the same bridge 60 years ago. Nowadays we have begun to appreciate the value of the water corridors which link Athy with so many other parts of the island of Ireland. Canal boats such as the 29B no longer travel the canal or the Barrow navigation as did the canal fleets of the past. However, a photograph of the same boat almost 60 years ago brings back happy memories of times past. Many of the faces captured in the photograph are surely recognisable. If you can put names on any of those pictured I would like to hear from you.